The new wastewater treatment plant in Galena has a working water wheel on its right side. Siding and roofing are going on the wastewater treatment plant structure and equipment was installed. The working water wheel was installed by the beginning of November. At their October meeting, Galena’s Village Council amended its 2010 Master Plan Map to reflect current annexations and rezonings. Changes also will allow rezoning of residential lots along Holmes and Harrison streets from Planned Industrial to Planned Residential. The industrial zoning dates to Galena Brick plant times and causes problems for residential uses including not allowing residential additions and structures to be replaced or built. Council extended the residential trash and recycling contract with Waste Management for 2019. Rates will stay the same but the contract includes an amendment that allows a potential recycling rate increase. This is due to changes in China, the largest recycling processor in the world. China is limiting quantity and quality of recycling it will accept. If Waste Management’s costs increase, those will be passed on to Village residents. Portions of the Walnut St. brick were replaced with asphalt. The brick road has been deteriorating since it was completed in 2014. During construction, it was found that the geotextile fabric in the road was completely deteriorated and the road, which was built as a storm water facility, is not draining properly. The Village applied for a grant to replace the brick section of the road but it was not funded. Work on the State Route 3/Walnut St./S. Galena Rd. intersection has progressed to the west side of Route 3. Paving should be complete this year but, due to light poles back ordered nationally, the traffic light will not be installed until 2019. Cemetery foundations were poured, potholes were filled with significant repairs made on Holmes St., and the ball field irrigation system is being completed. Council vacated a dead end alley on High St. that has no public use to allow an adjoining property owner to proceed with a home addition. In the Village’s 2010 Master Plan, residents expressed concern over new developments but agreed that it was preferable to control the density and nature of developments occurring around the Village that impact Galena. M/I Homes has started construction on the Retreat at Dustin condominium project. M/I has signed on to the Galena New Community Authority which collects additional taxes for the schools and the Village. They have also paid $208,000 in first half sewer tap fees that go toward the new wastewater treatment plant debt. Homewood Corporation cleared trees to begin construction on the Estates at Blackhawk’s final phase on Dustin Rd. A pre-construction meeting was held with Pulte Homes prior to starting construction on the Arrowhead Lake Estates single family and condominium project. Fiscal Officer Suzanne Rease is working with the Village Solicitor on investing the sewer tap fees. Rease reported that the Regional Income Tax Agency (RITA) sent 206 letters to residents stating that they had not filed their income taxes. She is working with RITA to learn details and confirm that these are all actually working or living in the Village. We ask everyone to keep your storm drains clear from litter and debris. Big things on top of storm drains make big water problems like flooding and water degradation. Little things, such as candy wrappers leftover from Halloween and sticks and twigs, can accumulate to make big water problems, too. Don’t dump down storm drains because that pollution can flow straight to a creek or river. Periodically, when the weather is nice, take a glance at the storm drain to see if any debris is near it. If you see debris, recycle, compost, or trash it. The most common complaint the Delaware Soil and Water Conservation District hears about storm drain dumping is about people throwing pet waste down the storm drain. Pet waste needs to go in the trash. Don’t compost it. The second most common complaint is about rinsing paint cans and buckets near storm drains. To dispose of unwanted paint, dry it out by using kitty litter. After the unwanted paint has been absorbed by kitty litter, dispose of it in the trash. Enjoy the treats that come with Halloween time; just don’t let any candy wrappers fall near neighborhood street storm drains. To report someone dumping down a storm drain, call the Village of Galena at 740-965-2484. Council’s Personnel Committee met to review staff recommendations for 2019 personnel. Their recommendations are being forwarded to the Finance Committee for review with the proposed 2019 budget. We wish our Maintenance Employee Cody Hale a fast recovery from a broken leg. Hale will be off work for 8 weeks. The Zoning and Planning Commission met Sept. 19 and Oct. 17; the Finance Committee met Nov. 1. All meetings are at 7 p.m. in the Village Hall Council Chambers, 109 Harrison St., unless noted otherwise. Zoning & Planning Commission meetings are on the third Wednesdays of each month. Council meetings are on the fourth Mondays of each month. Residential trash days are on Fridays but move to Saturdays due to New Year’s, Memorial, Independence, Labor, Thanksgiving, and Christmas holidays. Saturday dates are noted. The Galena Historic Foundation’s (GHF) Beans and Cornbread dinner was a big success. Thanks to everyone who assisted and attended. The event celebrated the first anniversary of the foundation’s museum in the Village Hall lower level. Stop in to the museum on the first and third Saturdays, 10 a.m.-3 p.m. The foundation has three new members: Forrest Hale, Carol Wood and Mike Atkinson. Due to Thanksgiving, this month’s meeting will be Nov. 28th, 7 p.m.
December 2, 2018, 6-8 p.m. Join us to celebrate the holidays 6-7 p.m., at Journey Fellowship Auditorium, 70 N. Walnut St. Bring your cameras to capture your little ones visiting Santa! Drop off a dozen cookies to share and enjoy crafts, games, cookies, and hot chocolate. Be sure to pick up your free coffee cups filled with goodies from the Galena Historic Foundation. You can also visit downtown businesses during their open houses. Then join us at 7 p.m. on the Village Square for traditional stories, carols, and the tree lighting. Be sure to get your free annual Village holiday ornaments while they last. 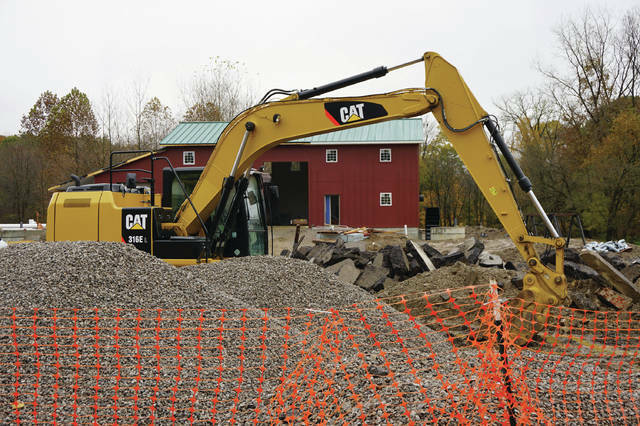 https://www.sunburynews.com/wp-content/uploads/sites/48/2018/11/web1_DSC03547.jpgThe new wastewater treatment plant in Galena has a working water wheel on its right side.